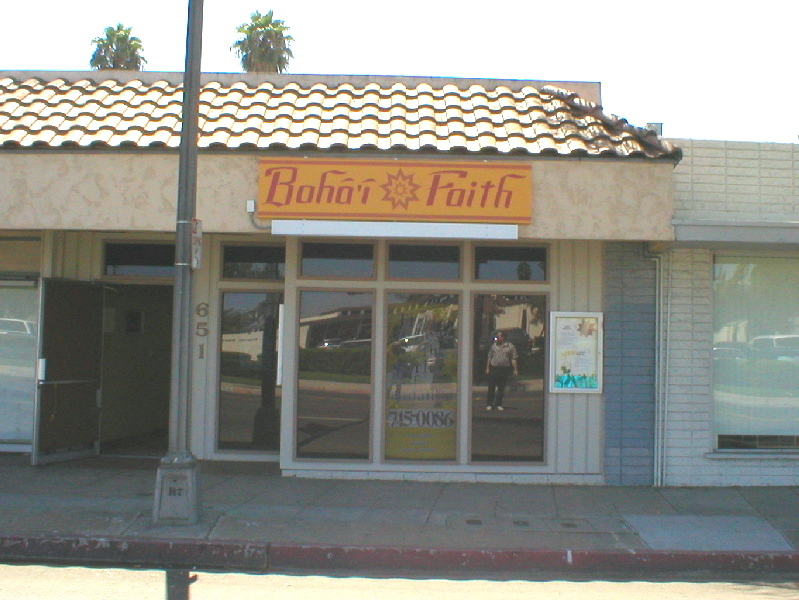 The Escondido Bahá’ís recognized that they had outgrown their most capacious domestic spaces and would need to find a larger commercial building for gatherings many months before the January 1997 opening of their current center downtown. They established a specific fund for the acquisition of the center and called on the nearby Bahá’í communities of San Marcos and Valley Center to help with initial costs. In short, the decision to rent a building in which to establish an official center of community life was not rash. But just a few years after setting up shop, the Bahá’ís found that they simply could not afford the rent payments. Although Bahá’í law enjoins all members to contribute to the local fund regularly, the amount a person gives is left up to the individual believer. The result is that the Local Spiritual Assembly, the nine-person administrative body of the local community, has no foolproof way to estimate what the community’s income will be six months in the future. Disheartened, a Bahá’í representative went to the landlord and broke the news that the community could only afford to keep the center if they could rent it for half price. Naturally, the landlord disliked such an unprofitable business arrangement and declined the request. The community knew they would have to give up their center in the following months and they prayed collectively for the best solution to their predicament. Would they go back to meeting in homes? Find another building to rent? Then one day the landlord approached the Bahá’ís saying he had changed his mind and the rent would be cut in half from then on. This is one reason why the Bahá’ís cherish their center so much: they were very close to losing it at one time. The Escondido Bahá’í Library is much more of a religious center than a library: zoning laws necessitated the current appellation. However, either coincidentally or out of a desire to live up to its name, the library does have the second most comprehensive collection of Bahá’í reference materials in San Diego County. 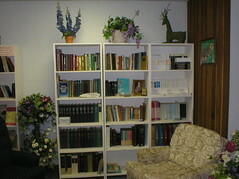 With roughly three hundred books and forty videos, as well as an extensive archive of World Order magazines (academic articles on Bahá’í-related topics published quarterly by the National Spiritual Assembly of the Bahá’ís of the United States) the Escondido Bahá’í Library is one of the best places to do Bahá’í research in San Diego County. Even so, most people who use the building don’t refer to it as a library– they just call it “the center,” reflecting the fact that many Bahá’ís have jobs and children and are much more interested in the building’s capacity to hold people rather than books. In any case, the library is the first room one encounters when entering the center. 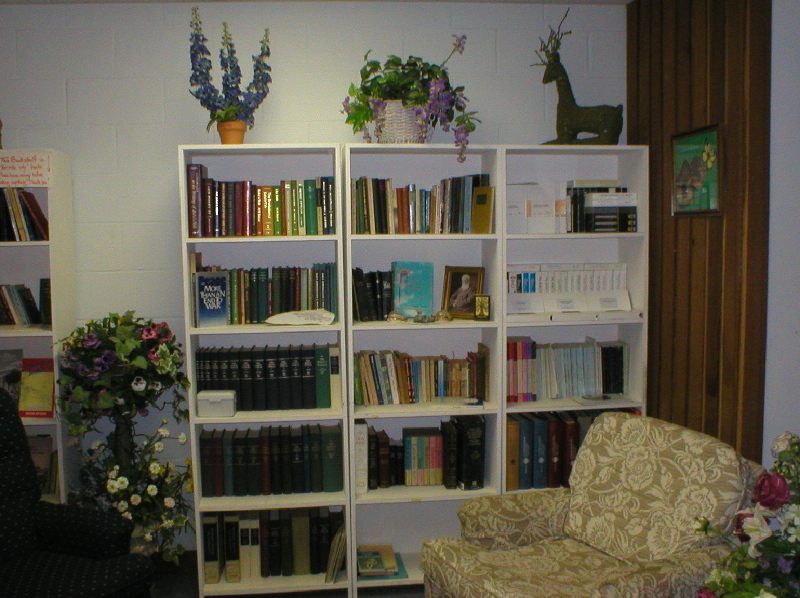 A wall of bookcases display the library wares and a Persian rug, easy chairs and flower arrangements ensure a relaxing environment in which to browse. 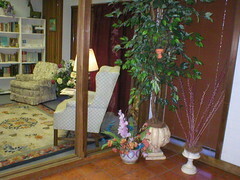 Several standing lamps provide soft mood lighting which explains why the library area is so often used as a private prayer room as well. Next to the library is an administrative office which leads into the main meeting room where most of the public gatherings and worship services take place. Two large dry erase boards with lists of community goals show the remnants of a brainstorming self-evaluation meeting, and numerous bulletin boards offer even more lists of short-term and long-term local plans and youth objectives. 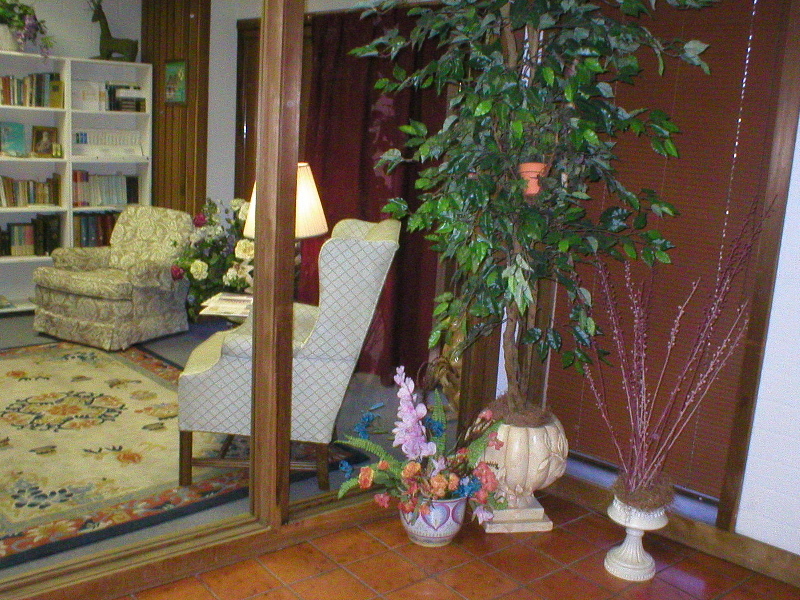 This main room also has a television and the capacity to hold about 45 folding chairs. Down the hall lie storage cabinets, a kitchenette, and the Children’s Room. 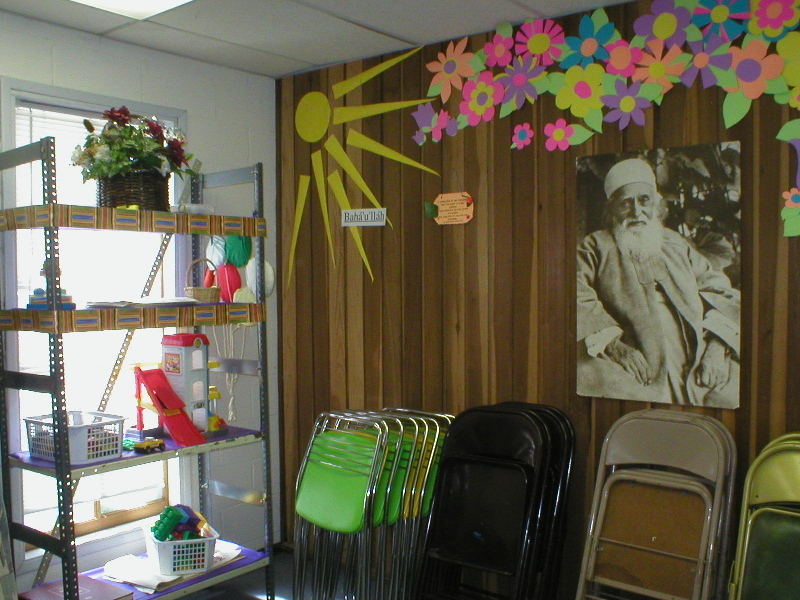 This final room is plastered with art projects and craft supplies and is home to the community’s children’s classes. The library is located in a strip mall in downtown Escondido. From the 15 Freeway south, take the El Norte Parkway exit and turn left onto El Norte Parkway. After about a mile, turn right onto Center City Parkway. Then turn left onto 2nd Avenue, go about half a mile, and make a slight left onto Valley Blvd. Soon after, make a slight right onto East Valley Parkway. The library should be on your right, a five minute walk from Palomar Hospital. From the 15 Freeway going north, take the Valley Parkway exit towards downtown. Turn right on Valley Parkway, which becomes Grand Avenue, which in turn becomes 2nd Avenue. Make a slight left onto Valley Blvd, then a slight right onto East Valley Parkway. The library should be on your right. 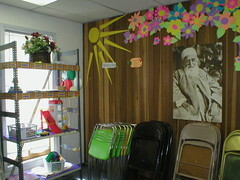 The Escondido Bahá’í Library has no official staff and few regular events, which are advertised to the members of the local Bahá’í community through a monthly calendar entitled Bahá’í-Lights. Nevertheless, it manages to host an impressive array of activities on an as-needed basis, including 1) Firesides: informal talks introducing the basic principles and history of the Bahá’í Faith 2)Devotional Meetings: a chance for Bahá’ís and non-Bahá’ís to take turns reading prayers and selections from the holy writings of the Bahá’í Faith and occasionally other faiths 3) Ruhi Study Circles: scripture-based, participatory classes on Bahá’í topics 4) Local Spiritual Assembly Meetings: gatherings of the community’s nine-person administrative body 5) Holy Day Celebrations 6) Children’s classes: instruction in Bahá’í principles and history and memorization of the Bahá’í Writings and 7) Nineteen-Day Feast Observances: gatherings of Bahá’ís once a Bahá’í month (every nineteen days) to worship, socialize, and discuss business matters related to the local community. Visitors are more than welcome– they are sought out. Non-Bahá’ís are particularly encouraged to attend study circles, Firesides, children’s classes, and devotional meetings. However, because no one is actually employed to manage the center, event times and regular “open-house” hours from 1-5 p.m. on Saturday and Sunday are subject to change. Prospective visitors may want to contact Russell Norman to make sure the center is open. Because the Escondido Bahá’í Community has a significant number of recent Iranian immigrants who struggle with English, Feasts are conducted in English but often translated into Farsi by community volunteers. In order to encourage cooperation and foster love and unity between the English-speaking and Farsi-speaking Bahá’ís, the center has recently started hosting an event where English speakers may teach English and learn Farsi and Farsi speakers may teach Farsi and learn English.